The occupants of the truck were taken to a hospital. Two others were treated at the scene. 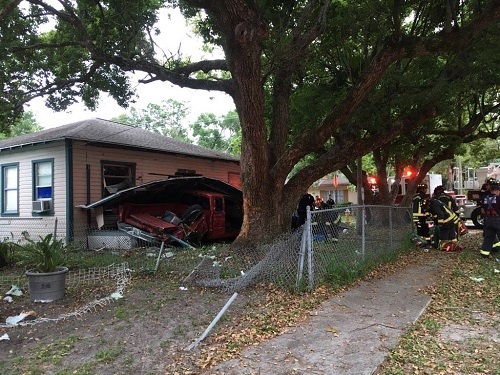 CLEARWATER – Four people were injured Sunday (April 14) when a truck crashed into a home, according to Clearwater Public Safety. Details of the crash were limited and names of the injured were not immediately available. Clearwater public safety officials said police and firefighters were called to the Vine Avenue home about 6:41 p.m. 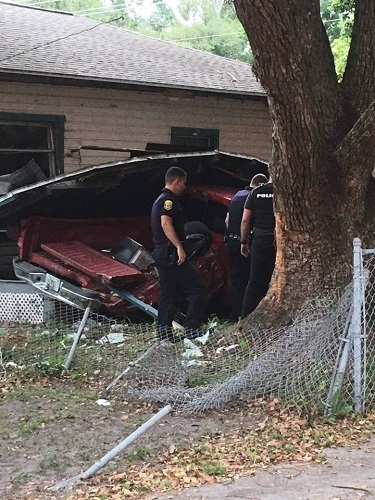 The two people in the truck were taken to Bayfront Health St. Petersburg as trauma alerts. Two other people were being treated at the scene by fire paramedics. One of those had been on the porch; the other, tried to help rescue the truck’s occupants. Photos courtesy of Clearwater Public Safety.